If you were asked, "What is your political philosophy?" how would you reply? Would you say, "I'm a Republican", "I'm a Democrat", "I'm a Liberal", "I'm a Conservative", or would you say, "I just vote for the best candidate"? You might even say, "I don't really have a philosophy of my own. I've never thought about it." If you say you're a Republican or Democrat, don't you really have an affiliation? Is there a philosophy that causes you to have that affiliation? 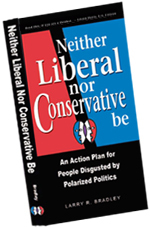 If you say you're a Liberal or Conservative, then exactly what is your philosophy? Without simply reciting a list of issues you support or oppose, in 50 words or less, tell me what liberal or conservative means to you. Remember the old saying, words don't have meaning, people do. If you say you vote for the "best candidate," then what criteria (in other words, philosophy) do you use to make that choice?